Self Adhesive Se-tenant Strip of Five Stamps. For a small country, New Zealand has a diverse array of plants and animals that can not be found anywhere else in the world. Unfortunately though, many of our animals struggle to survive due to introduced predators, environmental changes and the modernisation practices of man – as a result their numbers have dwindled to such an extent that they are officially classified as ‘endangered’. Luckily, New Zealand is a nation of wildlife champions. We recognise and appreciate that these unique – and iconic – animals are as much a part of our nation and nationhood as we are. In this issue we celebrated their individuality, and their abundant charms with a unique artistic range of five vibrant stamps. What makes these stamps stand out as different is the fact they are round rather than the usual rectangle. The ugly-but-beautiful tuatara is proving a fascinating specimen for scientists studying the evolution of lizards and snakes – the tuatara’s closest living relatives. Tuatara are often referred to as ‘living reptiles’ because they have remained mostly unchanged in their 200 million years of existence. 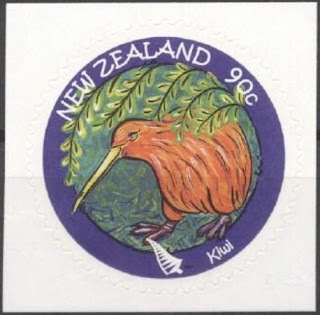 Single 90c 'Kiwi' self-adhesive stamp. The kiwi is perhaps New Zealand’s most recognisable icon – a flightless bird whose closest relatives are the emu and the cassowaries. This shy, nocturnal creature is noted for the proportions of its eggs, which can be up to a quarter the weight of the female – and for its long beak, with nostrils at the end to help it sniff out prey. 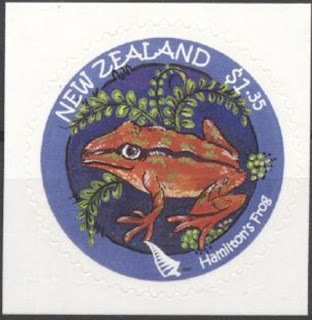 Single $1.35 'Hamilton’s frog' self-adhesive stamp. The Hamilton’s frog (Leiopelma hamilton) is named after Harold Hamilton, who first collected the species. The Hamilton frog is one of only four belonging to the ancient family and is found on only two small islands, in the Marlborough Sounds. 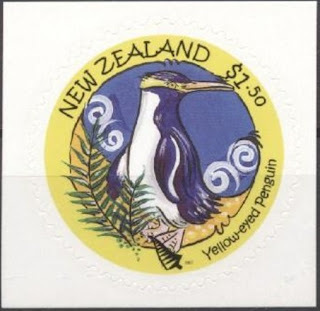 Single $1.50 'Yellow-eyed penguin' self-adhesive stamp. With a current population of around 4,000, the yellow-eyed penguin (or hoiho) is one of the world’s rarest penguin species. 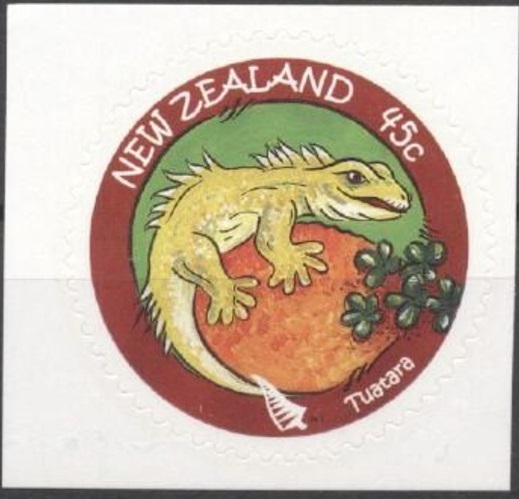 It is found only in southern New Zealand, Foveaux Strait and on Stewart Island and the Auckland and Campbell Islands. Solitary breeders, the penguins maintain the largest territory size of any of their kind, sometimes up to one nest per hectare in forested areas. 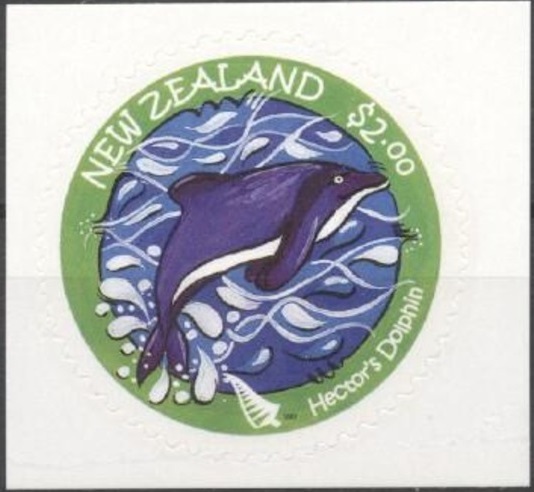 Single $2.00 'Hector’s dolphin' self-adhesive stamp. The Hector’s dolphin is named after Sir James Hector, the curator of the Colonial Museum in Wellington who examined the first specimen found. Today, this smallest sea-living dolphin is also the rarest dolphin in the world, with three genetically distinct populations. First day cover with stamps affixed. Cancelled on the first day of issue - 7th March 2007. Plate/imprint blocks could be obtained by purchasing at least six stamps from a sheet. Barcode blocks were available in both A and B formats.